Malta’s three national emblems since independence – what’s behind them? The 1988 coat of arms of Malta. 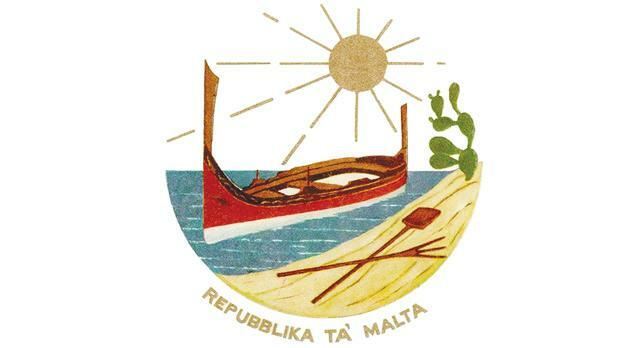 The 1975 Republic emblem of Malta. The 1964 Independence shield of arms of Malta. Artwork by Emvin Cremona for the Lm2 decimal definitive issue stamp. Courtesy of Heritage Malta/Maltapost. 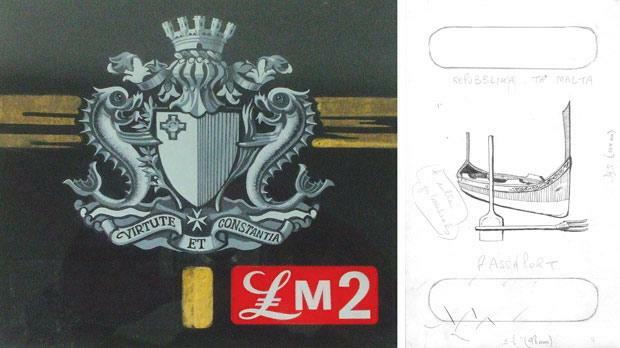 Right: 1975 preliminary sketch by Edward Abela for a new passport, which eventually became the emblem of the Republic. Edward Abela, who designed the Republic emblem of 1975, painting in Canada. In the relatively short span of 25 years, Malta conferred upon itself the luxury of three successive shields of arms. Each reflected important and less important political and national orientations. We probably all know what the iconic emblems looked like – but do we know much about how and why they came about? I regret to admit that the first Independence symbol is the one I know least about. Independence, that seminal turning point in our national identity, had to be marked by a new visual symbol, central to its nascent destiny. Malta already had some graphic images that associated with its history, like the eight-pointed cross and the George Cross, and could well have opted to work around those staple badges of recognition. It did not, probably because they were linked – and not too subtly either – with previous foreign dominations. Though both ‘colonial’, neither carried obvious undertones of shame or humiliation, as most colonial memories usually do. The eight-pointed cross of the Order of St John evoked courage, determination, Christian empathy with the afflicted; the George Cross evoked resistance, and then some more, against all odds until ultimate victory. I distinctly remember that wonderful artist Emvin Cremona discussing a similar shield of arms in great detail, and sketches in hand with my father Vincenzo. Cremona frequently consulted my father on artistic and heraldic matters. At that time my father was possibly the only person in Malta with a passion for heraldry and somehow versed in its arcana. I continue to harbour niggling doubts, however. Was Cremona actually discussing with my father an independence shield of arms for 1964, or was it the design for the commemorative 2d postage stamp issued in 1967 on the occasion of the Queen’s visit to Malta? That stamp had the Maltese independence emblem as its central theme. I am afraid I am unable to confirm which of these two possibilities corresponds to reality, and the question of a Cremona design input in the first emblem must remain open. The painter later reused the Malta Independence coat of arms on the Lm2 stamp of the definitive decimal issue of 1973. But to make up, on the Latin motto of that first Independence coat-of-arms I am able to shine some fresh light. Prime Minister George Borg Olivier settled for Virtute et Constantia, variously translated as courage, daring, valour for the first Latin noun, and as perseverance, firmness, endurance, tenacity or persistence for the second. The motto is hardly innovative, nothing like a Maltese brainwave by any stretch. In fact, it boasts of a long and vivid history, looking back more than two millenniums. The first time I have found that phrase documented is in Cicero’s celebrated defence Pro Sulla oratio, delivered by that superior Roman jurist and politician in 62 BC on behalf of Cornelius Sulla, accused of taking part in the Catilinarian conspiracy. And, in the wake of Cicero, the author of the chronicles of the Spanish War (possibly, but by no means certainly, written by Julius Caesar himself), also picked up the same buzzwords in his De bello hispaniensi, around 40 BC: virtute et constantia. Closer to home, Grand Master de Valette relied on that turn of phrase in a dispatch to King Philip II of Spain to describe the victory of the Great Siege of 1565 – through daring and perseverance – almost certainly penned by his proficient Latin secretary Sir Oliver Starkey, who would have known his Cicero and other Roman classics thoroughly. De Valette’s choice of words, in turn, is said to have inspired Antonio Sciortino in his concept for the bronze Great Siege monument in Republic Street: Malta flanked by daring and perseverance. But, almost certainly not by coincidence, Pope Pius IV had also addressed two briefs to the Grand Master after the raising of the Great Siege, using almost identical words: incredibile virtute admirabiliaque constantia (through unbelievable valour and admirable endurance). Borg Olivier’s choice fell on a phrase with a long and distinguished lineage, doubly connected with one of the most salient episodes in the history of Malta. Not to demean the Independence coat of arms, but the same motto Virtute et Constantia had also been previously adopted by a number of noble families in Europe. The security police of Estonia similarly identify with the motto of the 1964 shield of arms of independent Malta. Since independence and before Malta became a republic, the Governor-General used the same emblem, but substituted the British royal crest (a golden lion standing upon St Edward’s crown) for the mural crown. He did that as he represented Elizabeth I, Queen of Malta, on the islands. Before independence, the George Cross stood on a blue square (canton). Some interpreted the blue as a reference to the third colour (tincture) in the Union Flag, though more likely it stood for the blue ribbon of that decoration. The blue background was removed with independence – but that created a problem. In heraldry, white stands for silver, so the silver George Cross would have stood directly on a silver ground making it technically invisible. A red piping (fimbriation) was added around the cross to avoid this. I am in a position to reveal much more of the unpublicised goings-on which led to the ‘Republic’ emblem, officially launched on July 11, 1975. Dom Mintoff, then Prime Minister, wanted to get rid of Malta’s constitutional coat-of-arms, on the mistaken assumption that the crown over the red and white Maltese shield represented royalty, and consequently had no legitimacy once Malta had ditched the monarchy and become a republic. This was patently wrong – the mural (or walled) crown on the Independence shield had nothing to do with royalty or with the royal crown – the various mural crowns stand for demarcated territories or for national sovereignty, not for monarchy. In fact, after the rebellion which led to Spain becoming a republic in 1873, the country’s coat-of-arms remained the same, but Spain substituted the old royal crown by a mural crown – exactly to underscore the change from monarchy to republican status. And when, after World War I, Austria became a republic, the Austrians removed the double royal crowns from their coat-of-arms and placed the mural crown instead. Malta already had, since independence, a mural, conveniently republican, crown, on its shield. I have the full story of the second emblem directly from the horse’s mouth. Edward Abela, then assistant general manager at Mid-Med Bank, had a marked interest in art and attended evening courses in painting techniques given by the distinguished Maltese artist Esprit Barthet. Mcast hosted those classes. One evening, Barthet shared with his students an invitation he had received from the authorities – his class had been chosen to come up with a design for a new passport – no mention of a national emblem at that stage. Barthet added that this would be a unique opportunity for the art class to be given official recognition – it had been specially selected to carry out that important task. He appealed to the students not to let him down and to take part in what, in substance, would be an art competition with a difference. Barthet specified that the design was to include the Maltese dgħajsa and two farming implements, a shovel and a winnowing fork – possibly the sun too. Abela rose to the challenge and, though not requested, inserted a prickly pear “to complete the scene”. Great was his surprise when his art teacher revealed to him that his design had been selected by the Prime Minister personally, together with the entry by another student. Would they collaborate to produce a joint drawing? Not the best of ideas – too many artists spoil the emblem – and eventually the job to finish and polish off the concept of the design fell on Abela alone, with instructions to liaise with the Foreign Office. Maurice Abela of that department hurried Edward Abela up – Malta was running out of travel documents and Mintoff insisted that passports with the Independence emblem should stop being issued. Maurice Abela acted as intermediary between the designer and the Prime Minister – ‘a few frantic meetings’ – the latter proposing some changes, until a final design was agreed upon, with some input from the printers. 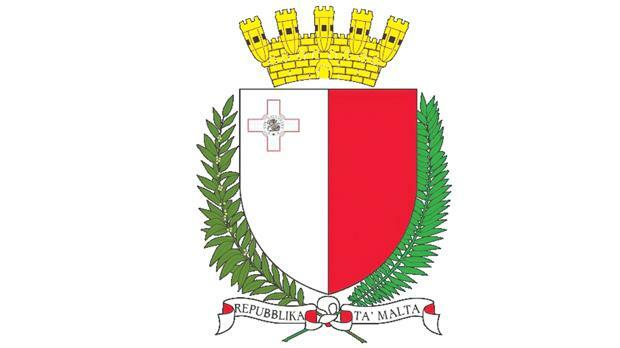 It was only at this late stage that Maurice Abela learnt that the design was to serve as the new emblem of the republic – would he have a word with Vincent Depasquale, Malta’s librarian and well versed in heraldry? In fact, Edward Abela’s design became the official new national emblem, and as such appeared on the freshly-printed green travel documents, popularly known as the Gaddafi passports. As Edward Abela had no experience in colour printing, this aspect of the task remained with Esprit Barthet. Maurice Abela enquired if Edward Abela had received the prize – which eventually turned out to be a cheque for Lm20, a set of the latest Malta stamps, and a letter of thanks on behalf of the Prime Minister. The new emblem, deliberately devised outside the parameters of the ancient rules of heraldry, raised quite some controversy in the House of Representatives and in the press. One highly-unconvinced expert called it “relentlessly anti-heraldic”. Mintoff was under the (mistaken) impression that the design had been submitted by a schoolboy (hardly so; Edward Abela, virtually my twin, was 39 then) – a misconception that found itself in the press and that no one had ever set right so far. It goes on being repeated to the present day. The round emblem included the legend ‘Repubblika ta’ Malta’ – another mistake. The official name of the state is ‘Malta’ and not ‘Republic of Malta’. Sadly, this constitutional blunder was carried over to the current arms. Edward Abela rose to become general manager of Mid-Med Bank and later of Bank of Valletta. In 1982, the Banca Commerciale Italiana of Toronto, Canada, offered him a job – and there he became its senior vice-president. When he lived in Montreal, Quebec, he exercised the functions of honorary consul for Malta. 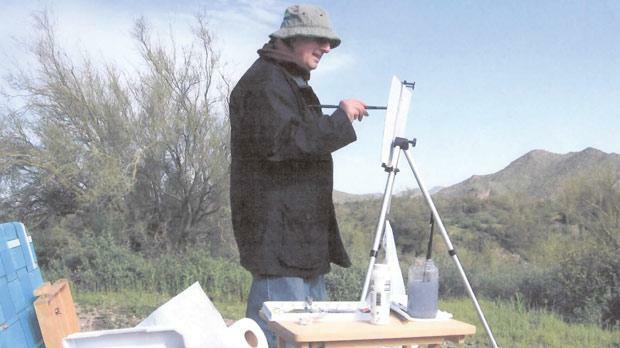 He now resides permanently in Ontario, and painting in water colour and acrylic takes up much of his time. After the change of government in 1987, the authorities felt Malta direly needed to project a fresh image. Many innovations were considered impellent: the new philosophies of governance were manifestly unable to identify further with the old perceptions of power. These, in turn, brought about an overwhelming reluctance to be profiled by previous symbols. It was thought pointless to market a new product in an old wrapping. The task of constructing that new national emblem was assigned to the Honours and Awards Working Committee, chaired by Adrian Strickland. Minister Ugo Mifsud Bonnici, later President, showed the committee some designs he had received from amateur volunteers, but the members rejected them as they were determined to revert to a design for the national arms that respected the traditional and hallowed rules of heraldry. Some discussions ensued as to whether Malta should adopt anew the first Independence emblem, or opt for a new one altogether. 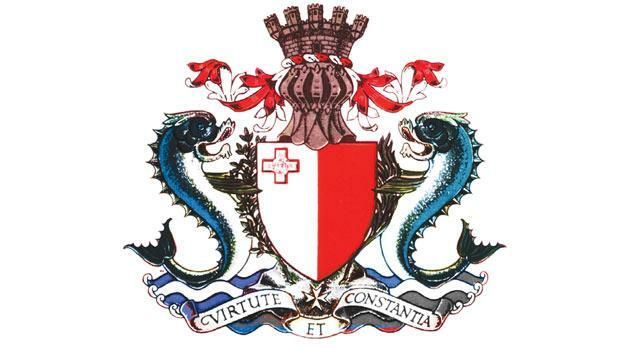 Richard Cachia Caruana believed the old insignia should serve as a basis for the new one, but in a version much simplified – with the elimination of a number of elements which the Royal College of Arms had originally inserted in the first national emblem. More debate followed about the scroll: should it contain the original motto Virtute et Constantia, or should it be Repubblika ta’ Malta like the previous one? Philo Pullicino proposed an altogether new Latin motto: Laetentur Insulae – let the islands rejoice, suitable to the positivity that was then sweeping Malta. Mr Pullicino must have known his Old Testament well. The phrase comes from Psalm 96: Dominus regnavit, exultet terra, laetentur insulae multae. But eventually Repubblika ta’ Malta prevailed for the scroll – quite uselessly, I believe. A national emblem is, in itself, a badge of identification, and should require no further emphasis to explain itself. Prime Minister Eddie Fenech Adami showed some unease at the omission of the eight-pointed cross but did not impose his views. The committee instructed Adrian Strickland to prepare preliminary sketches, which were then translated graphically into the finished design by Robert Calì. The Government Gazette formally promulgated the new emblem in virtue of the Official Seal of Malta Act of 1988. That new design has served Malta well for 23 years – far longer than any of its predecessors. Thanks to Marco Cremona, Edward Abela and Adrian Strickland for their constructive input.